Race Is On 1 Bet on Chet! Chet Morton for class president!” Frank called out. He shoved buttons into Lizzy Kahn’s and Elisa Hernandez’s hands as they walked past. He and Joe had made a hundred of the buttons last week for their friend Chet Morton. Each one said BET ON CHET! in giant blue letters. Joe stood beside Chet as he greeted all the Bayport Elementary students that came through the front doors of the school. It was just before the first bell. Everyone was in their fall clothes—brand-new jeans, and T-shirts from different places where they’d vacationed over the summer. “Take a cookie,” Joe whispered to Matilda, pointing to the table in front of them. Mrs. Hardy had sent them to school with a batch of her famous double chocolate chip cookies. It helped bring people over to their side of the lobby. “Do you really think I have a chance?” Chet whispered, glancing across the lobby. Cissy Zermeño was standing there with their other friend Phil Cohen. Behind them was a whole row of posters. TRUST IN CISSY, RE-ELECT CISSY ZERMEÑO, and YOU THINK SHE’S SO NICE, VOTE FOR HER TWICE! Cissy had been president for one year already, and most of the class really liked her. Frank, Joe, and Chet liked her too—she was one of their friends, and she played with them on their baseball team, the Bayport Bandits. Chet greeted a few more students as they walked in the door, shaking hands with them like a real politician. He was wearing a collared shirt and khakis. He’d worn almost the same outfit every day for two weeks, since the campaign had started. “I guess I’m just nervous,” he said after a group from their gym class left. “It’s normal to be nervous,” Joe said. He was eight years old and the younger of the two Hardy brothers, with blond hair and blue eyes. His older brother, nine-year-old Frank, had dark brown hair and brown eyes, and looked much more like their dad, Fenton. Fenton Hardy was a private investigator in Bayport. The boys had learned everything they knew about solving mysteries from him. Joe looked around the school lobby. Most of the kids had gone inside their classrooms already. Even Phil and Cissy were packing up their table. “Let’s just wait until they go . . . ,” Joe whispered. He wasn’t usually so suspicious of people, but everyone was saying it was going to be a close vote tomorrow. 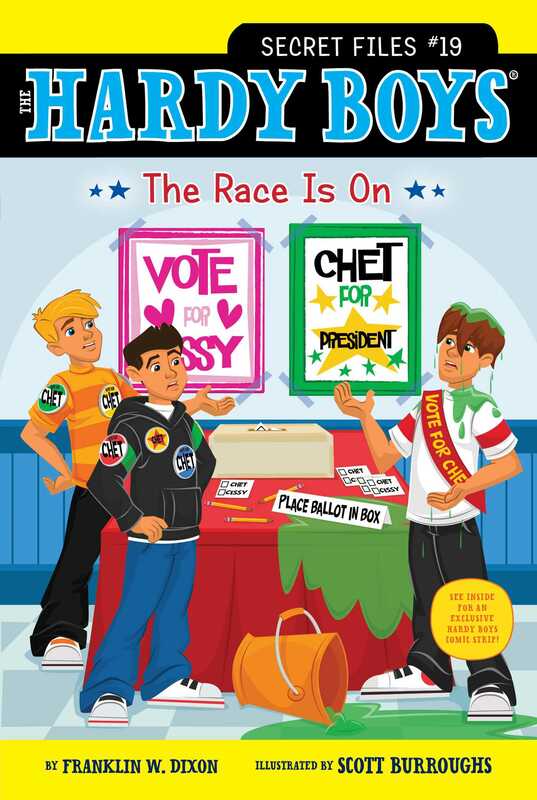 Many students had promised to vote for Chet, but promises didn’t mean they would actually do what they’d said. It was going to come down to the speeches. They couldn’t let Cissy know what he planned to say. Frank glanced sideways at his brother. Cissy was the pitcher for the Bandits, and it seemed like she was always winning at everything! But even though she’d won the talent show last year and the science fair the year before that, it was hard not to like her. She was always so nice and always did the right thing. “You too,” Chet said, shaking Cissy’s hand. Phil stood beside her, and for the first time Frank noticed that the button he wore lit up. CISSY’S #1! it said, the number one glowing white. Frank could tell Phil had made it himself—he was always making little gadgets. He loved playing with robots or taking apart his parents’ old computers. “We’ll see you tomorrow at the assembly,” Phil said, before the two of them turned to go. When they had disappeared down the hall, Chet pulled the folded speech from his pocket. The paper was worn in places because he’d practiced the speech so much. “Ready?” he asked, looking from Frank to Joe. A few girls came in from outside, talking about a school dance that was being held next week. Chet stopped until they’d passed. When he began again, he talked about all the things he wanted to do for their class. He would get them better lunch choices in the school cafeteria and get picnic benches so they could eat lunch outside if they wanted to. He had another idea called “New Voices.” He wanted to give different students a chance to read the morning announcements, instead of having the same people do it every time. Joe’s and Frank’s favorite idea was for a School Sports Night, where teachers and students would compete for prizes. Chet looked up from his paper, waiting to see Frank’s and Joe’s reactions. Both of the boys cheered and clapped. “Every word was perfect,” Frank said. “Who wouldn’t vote for you?” Joe asked. As the bell rang to start class, Frank and Joe collected the BET ON CHET! buttons and their chocolate chip cookies. They ate the last of them while they walked Chet to class.